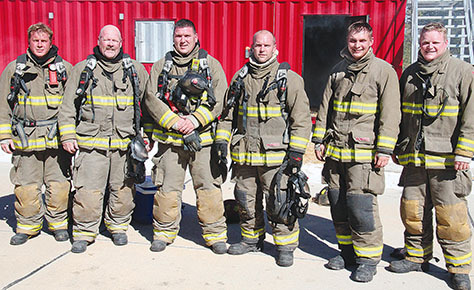 1,000 DEGREE CLUB — Albion firemen who were in the structure when ceiling temperature reached 1,000 degrees on Saturday were (l.-r.) Cole Frey, Bruce Benne, Jason Borer, Ben Edwards, Michael Schriver and Kyle Larson. Albion Fire & Rescue members received their first training last Saturday, Oct. 7, in the new steel structure provided by Fire Training Structures, LLC. This training was intended to teach firemen how to operate the various features of the structure, to heat temper the structure’s “burn room,” and to allow firemen to experience the hot interior temperatures that can build up in a structure fire. Firemen experienced the heat in a room adjacent to the “burn room” on the lowest level of the training structure, south side. In the first session, the ceiling temperature was brought up to 600 degrees and cooled back down. The second session brought the ceiling temp to 800 degrees, and it reached over 1,000 degrees in the third and final session. Water was not used to extinguish the fires after these sessions. Vents to the burn room were closed to remove oxygen and put out the fire. The training structure consists of three steel compartments that can be used to create many different fire/rescue scenarios. 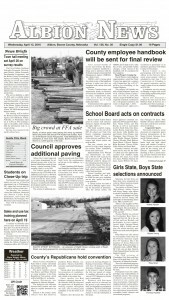 The facility was purchased in May at a cost of $208,000 and installed in September. This facility is available to area departments for training, and several departments have already expressed interest. An Albion Fire & Rescue member will be present for all training sessions.